Inspired by the elegant Chateau de la Fuente, home of the world famous Arturo Fuente tobacco plantation, the Double Chateau Fuente is a unique creation of the family’s private stock of specially aged tobaccos. 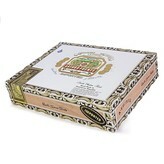 The Chateau Fuente line is hand made the same way Don Arturo made it 100 years ago. The Natural Connecticut Shade wrapper and aged tobaccos are encased in a thin cedar sleeve packaging, providing a natural humidor effect, to enhance the cigar ensuring for a great hour of a smoke. The Double Chateau Fuente is a medium bodied wonder. As with all of Fuente’s premium cigars, the special blend emits a creamy smooth smoke throughout the hour. Flavors of cedar and spice are gentle on the palate. This cigar is a heavenly experience. Take lemon and moisten rim of highball glass. Sprinkle superfine sugar on rim of glass. Combine Evan Williams Bourbon, Triple Sec and lemon juice. Shake ingredients together with cracked ice. Strain into prepared highball glass. Garnish with a lemon twist. Fabulous!